This is another sunflower photo I took a while ago. (Click here to see Autumn Sunflower 1). These flowers are not on the farm; I came upon two entire fields of them while driving through the dense backwoods not far from our property. They were everywhere I looked, so different than anything I had ever seen, and the brilliantly colored trees that surrounded the fields made a wonderful backdrop. I found myself entranced, snapping pictures and oblivious to the spattering rain falling on me (and my camera). I ended up with 7 photos I really like, and am toying with the idea of a series of blank notecards. The bizarre, silent, and totally unexpected landscape had such a mysterious, almost eerie (but not at all depressing) feel to it, and I think it comes across in the photos--or maybe you just had to be there. What do you think? Do You Think She's Been Stolen? I had such an eerie feeling in my forest (and people have written about such feelings in the Irish Wilderness in south central Missouri) but I think not only would I have to be there to feel what you felt, I have to be YOU to feel what you felt. I think much/most of what we consider outside influence on our state of mind is filtered/interpreted by our inside state. You might be able to return to this same field and yet not feel that eerieness as vividly or at all. This kind of thing interests me, obviously. I can see what you're talking about in this photo and would love to see the others. I agree with Pablo too. Last night, coming down the mile long dirt road to my house I had "the eeries" because of the way the fog had moved in. It was low enough that it was like I was driving through apparitions. It was pitch black, quiet and I was alone in the car. I travel this road lots each day and don't usually get this way. It is very beautiful and perfectly defines the stark beauty which can be found in all of nature at any time of year. Living near the ocean, as I do, there is a wonderful different beauty here in the winter, as well. We are inundated with people all summer and now there is also a quietness in which to enjoy the beauty. Your photo is amazing, as one is even able to see the hairs on the stalk. What glorious pictures you take! I have a camera like yours and I love it, too. I would like to put you on my links list in my blog, if you have no objection. I love doing that with photos - creating a series of blank notecards, that is. Great thing to do for gifts is to order a 12 sets (usually of 12 cards each) of 12 different photos from Snapfish or one of those places and then shuffle the cards so that you have 12 sets of 12 different shots. Imagine all the combinations you could put together with photos of just the animals alone! Hello, Cary notecards would fly off the racks. Do you Etsy? If you did, these would be a hit. Calendars of photos are nice, too. You bet -- a batch of notecards would be so personal and so fun to write on. and, of course, your "fans" would probably buy them! what a wonderful site. I love it! Fantastic photo! I think a series of note cards is a great idea. I referenced you in my post today. 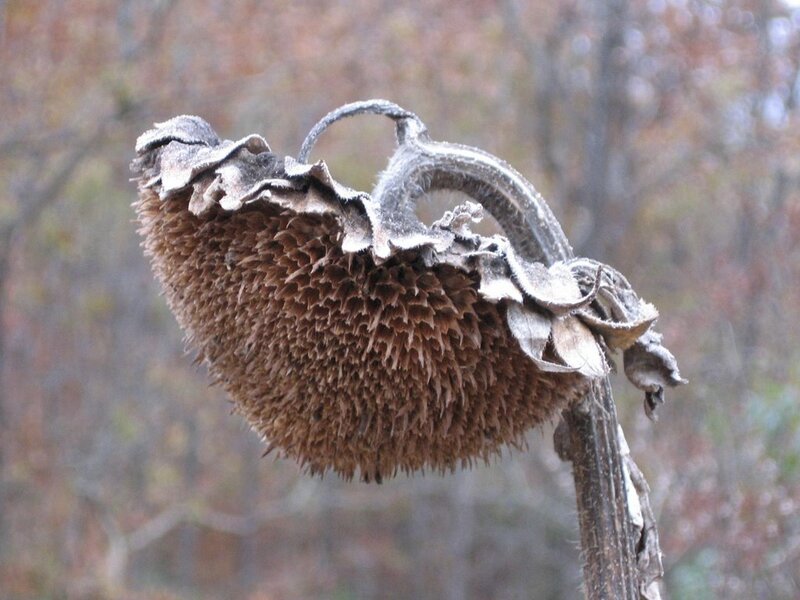 I love this time of year when some of the plants have died with the frosts of winter, yet still stand tall and beautiful in their dried state. Ghosts of summer gone, and sentinels for spring to come.